, as part of the collaboration we formed in October 2016 with the Australian Commonwealth Scientific and Industrial Research Organisation (CSIRO) and James Cook University (JCU). For the Debug team at Verily, Innisfail and the greater Cassowary Coast region of Queensland, Australia is an appealing place to undertake our research to reduce the invasive Aedes aegypti mosquito. As a tropical climate, Far North Queensland (FNQ) is more representative of the areas where Aedes aegypti mosquitoes usually thrive. In fact, FNQ not only has an established population of Aedes aegypti but also has experienced outbreaks of dengue, and as we noted in our blog post last year, JCU and CSIRO have a great deal of mosquito research experience in this region. Additionally, Debug Innisfail represents an essential next step and challenge for our technology and research design: the ability to support partners at a distance as they use our technologies to help make and release mosquitoes. For this field study, CSIRO is releasing sterile, male Aedes aegypti mosquitoes bred with Wolbachia into central Innisfail and several nearby communities through the region’s wet season. We will measure our success by monitoring changes in the number of biting, female mosquitoes in these release areas relative to similar neighborhoods nearby that will serve as controls. Though only minutes drive apart, the behavior of Aedes aegypti coupled with the separation of townships by fields of sugar-cane and river tributaries makes this a perfect place to see how far we can suppress the population of biting, female Aedes aegypti using our technology. This ecological isolation is because Aedes aegypti hover around human activity and travel on average less than 100 meters in the search for a mate, effectively making each township an ecological island, thus allowing us to measure our impact with more precision. 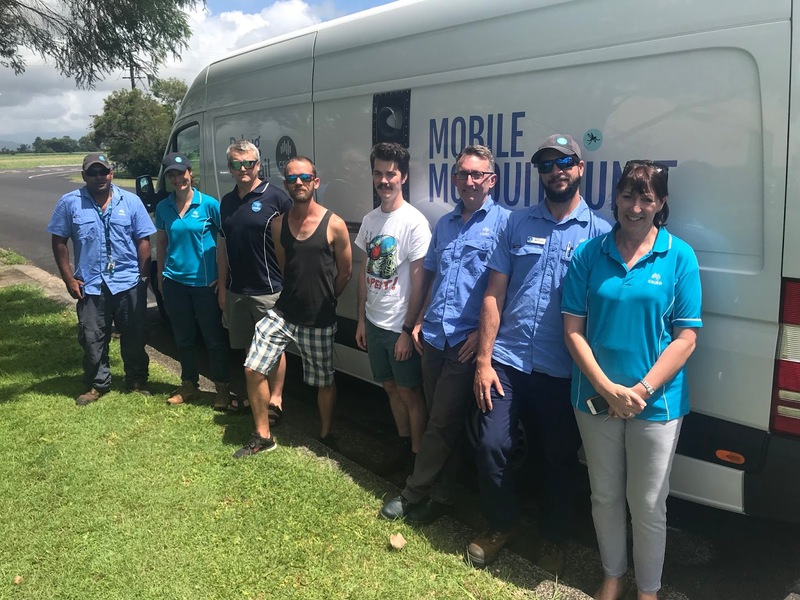 On Wednesday, November 15, the Debug Innisfail van (aka the “Mobile Mosquito Unit”, see photo) began work in Mourilyan, with CSIRO staff releasing mosquitoes produced at JCU near Cairns. As production ramps up, our partners will continue to expand the study to neighboring communities. Over the next week, releases will hopefully begin in two additional neighborhoods, South Johnston and Goondi Bend. Once Debug Innisfail is running at scale releases will occur in all study sites three times a week for up to 24 weeks. Members of the research and field operations team, including members of CSIRO and James Cook University, on the first day of releases. This month’s first releases are the culmination of over a year’s work in scientific and operational preparation. During this time, CSIRO and JCU, as well as researchers from the University of Queensland and the QIMR Berghofer Research Institute, reared Wolbachia Aedes aegypti mosquitoes, studied the size and behavior of the Aedes aegypti mosquito population in and around Innisfail, and built strong links with the community members and local government, including the Cassowary Coast regional council whose support has been a critical element of our launch. The research our teams have done together over the last 12 months has not only benefited our project design, but has also resulted in our first peer reviewed publication which we hope will benefit the field of mosquito research overall. CSIRO, JCU and ourselves all still have a huge amount to learn: how these non-biting males disperse and survive in the landscape, how well they find females in and around people’s houses, and how to operate our equipment a long way from our home base in California. We’re eager to see the impact these males can make on the biting, female population in these towns and take the next step in testing our technology in the field. This November, the Debug team at Verily took an exciting next step with the launch of our first international field study, Debug Innisfail, as part of the collaboration we formed in October 2016 with the Australian Commonwealth Scientific and Industrial Research Organisation (CSIRO) and James Cook University (JCU).